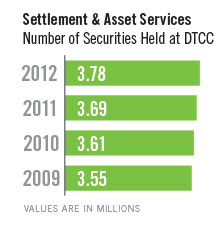 Settlement & Asset Services - Business Reviews - DTCC 2012 Annual Report | Securing Today. Shaping Tomorrow. 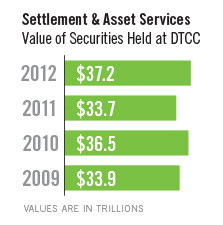 DTCC Settlement Services, offered through DTCC subsidiary The Depository Trust Company (DTC), reduce cost and risk and boost efficiencies in the marketplace by providing end-of-day net settlement obligations for clients resulting from trading activity in equities, debt and money market instruments. Asset Servicing, offered through DTC, offers a broad range of services for underwriting, custody, corporate actions, dividend, proxy and reorganization services, as well as the electronic registration and transfer of securities. In addition, DTCC's subsidiary DTCC Deriv/SERV LLC provides a range of post-trade processing services that reduce risk and bring greater operational and cost efficiencies to the trading of over-the-counter (OTC) derivatives instruments globally. Settlement Matching: To provide participants with increased settlement certainty by giving them the ability to authorize or match transactions prior to processing. CNS for Value: To create a single, transparent process for settling transactions from DTCC's Continuous Net Settlement (CNS) service versus payment at DTCC and subject to DTCC risk controls. Money Market Instruments (MMI) Transactions: To enhance the model for processing MMIs by aligning issuance and maturity activity within specific issuers and introducing a new optimization engine for settlement efficiency, eliminating the intraday reversal of all transactions. Shortened Settlement Cycle: To analyze the business case for shortening the settlement cycle for U.S. equity and corporate and municipal debt transactions from its current three days (T+3) to two days (T+2) or one day (T+1). The structural MMI enhancements described above will build upon a series of improvements that DTCC made in 2012 that change the settlement processing timelines for issuing and paying agents (IPA) to make better informed decisions regarding their exposure to an MMI issuer before the refusal-to-pay deadline. These recommendations were developed in conjunction with the Securities Industry and Financial Markets Association (SIFMA) in an effort to develop an MMI transactional model that better aligns with the Principles for Financial Market Institutions of CPSS-IOSCO. DTCC also provided industry leadership in 2012 with the release of a white paper that called for fully dematerializing the U.S. financial markets within the next three to five years. Accelerating the drive to eliminate the remaining physical certificates throughout the securities industry would contribute to a more cost-effective and efficient marketplace in the U.S. The paper revealed that as a result of successful ongoing dematerialization efforts, the industry has reached a tipping point in which the economies of scale for physical processing have been reversed. Today, the fixed costs to support physical processing are being recovered with dwindling transactions – meaning that as the number of physical issuances and transactions declines in the future, the unit cost of processing them will rise. DTCC will continue industry discussions on dematerialization in 2013 and begin implementing next steps once a consensus is reached. DTCC reached a significant milestone in its corporate actions re-engineering initiative in 2012 with the launch of a pilot testing for new ISO 20022 messages that cover the entire life cycle for distribution events. The pilot is part of a multiyear re-engineering initiative that will replace DTCC's proprietary files with ISO 20022 messages and replace multiple legacy applications with a single platform that will incorporate all event types. This also marks the first time DTCC will support inbound customer ISO 20022 messages for elective dividend events, which will further reduce risk and cost in corporate actions processing, moving closer to the goal of straight-through processing. The re-engineering for distribution events is expected to be complete and fully deployed by mid-2014. In 2012, the Trade Information Warehouse (TIW) seamlessly processed payment calculation and settlement instructions for 27 credit events totaling US$124.6 billion in bilateral net fund transfers between buyers and sellers of protection. TIW also managed 72 merger, reorganization and name change succession events, as well as two restructurings, which included one for the reference entity on the Hellenic Republic. In a joint effort with settlement agent CLS Bank International (the operator of the world's largest multicurrency settlement system), TIW ensured on March 26, 2012, the successful settlement of US$2.89 billion in net payments on Greek sovereign credit default swaps (CDS). Overall in 2012, TIW's central settlement service facilitated the calculation, netting and central settlement of approximately US$180.4 billion in multilateral net payment obligations in 10 currencies in conjunction with CLS Bank. 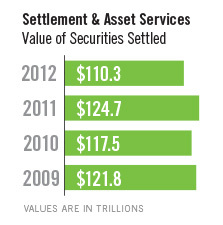 TIW also expanded the list of OTC derivatives instruments it supports in 2012. Working with MarkitSERV and the International Swaps and Derivatives Association, TIW added settlement and event processing for three variations of Standard Municipal Credit Default Swaps contracts in April; in June, support for European Asset-Backed Securities went live. In 2012, the Equity Cashflow Matching platform, which provides settlement service for the OTC Equity Derivative market, seamlessly processed 225,000 payments transactions, which were netted down to 185,000 transactions with a total dollar value of US$53.1 billion. Omgeo, DTCC's joint venture with Thomson Reuters, experienced significant growth in one of its core processing services last year, reflecting increased adoption by financial institutions. Omgeo, which automates post-trade processes between investment managers, broker/dealers and custodian banks, registered a 33% increase in the number of clients using Central Trade ManagerSM (Omgeo CTM), the firm's strategic platform for central matching cross-border and non-U.S. domestic equity, fixed income and contract-for-difference transactions. This increase was driven by business growth in Europe and Asia, the expansion of Omgeo CTM into exchange-traded derivatives processing and the migration of clients from Omgeo's legacy OASYS GlobalSM platform. To date, 400 brokers have migrated to Omgeo CTM. During the year, Omgeo also announced key changes to Omgeo ALERTSM, Omgeo TradeSuite IDSM and Omgeo CTM pricing structures, including incentives to promote industry best practices and, in particular, improved settlement instruction data quality and faster trade affirmation. 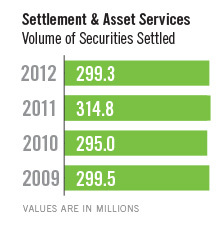 In 2012, Omgeo was named Securities Services Technology Provider of the Year in the annual Custody Risk Americas Awards and, for a third year running, Best Exceptions and Reconciliations Management Provider in the Waters Rankings.